Good Sunday Morning Everyone! I hope everyone's off to a great day whether it's church or just relaxing @ home. My card for today is for 2 challenges. The Inspiration Challenge on SCS and Taylors' Cupcake Challenge. I didn't use a cupcake but I did follow her sketch...I LOVE it!! The colors of my card was inspired by this piece. Aren't those colors pretty on that plate. I immediately thought of this paper that I received from a friend of mine and the rest was easy! Oh, the button....I picked up a bag of buttons a LONG time ago and just recently placed them in a glass jar. This particular button stood out to me so I grabbed it hoping it would work...it does! Thanks so much for stopping by today! Enjoy your Sunday!! Boy, and I thought I was up early!!!!! This is beautiful. Love the colors and I just love that bird! This turned out very pretty. I like that background paper. And thanks for the link to the sketch. I got a new Wish Rak image yesterday that I have been wanting to try out but wasn't sure what to do with it. The sketch will be perfect. Fabulous! This is such a beauty. Love the colors and your wonderful design. That button is a perfect match! So pretty, Jackie! I love that cool button you used! Thanks for playing the challenge! 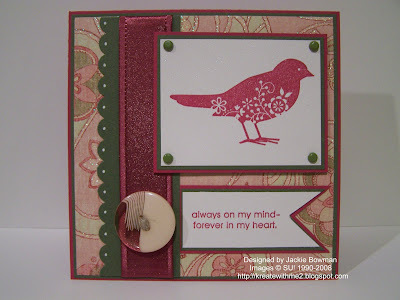 Love the colors and lo of your card! You rocked the challenge! Jackie, this is so pretty! Love the paper and design. I'm just relaxing here, still not feeling that great with this second session of throat and sinus in a month. Hoping to get some enery back soon. Take care and enjoy the rest of your Sunday and the upcoming week. Will check with you soon. I love the colors on this card! Great Job with the Sketch. I have this one on my list to do as well! Such a beautiful card! Love the button! I LOVE this bird! Good challenge card! Lovely card and what a very pretty stamp! The button is perfect! It really stands out and anchors the sentiment! Great card!